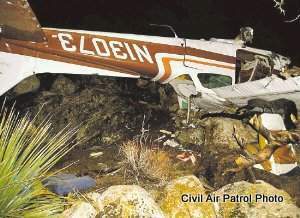 This is an article on the one-year anniversary of California Wing's save of Rocky Harvey and Warner Henry in a Cessna 172 on the snow covered slopes of Joshua Tree National Park. The article is located here at the The Desert Sun website. "Finally, he heard the drone of an airplane circling above. It was comforting to know someone was up there, but no one would reach them until morning, Rocky figured. No one could be stupid enough to attempt a rescue in such a wild storm. Rain beat against the airplane, and there was a risk it would ice over if the Civil Air Patrol crew climbed too high. It was the most difficult search Capt. Frank Tullo had ever conducted." You will be relieved to know that the two survivors are getting better every day.